Daniel Tiger is my son’s life coach. He has autism and Daniel’s cute and catchy songs help him for almost any situation in his day-to-day routines. He always wants me to sing a song first so he can sing it second just like Daniel and friends. The “Use your words”, “Give a squeeze”, “Daytime routines”, “When you can’t get what you want”, and “Frustrated”, just to name a few, all help him immensely and I am so grateful for this app whenever he needs a little short reminder, because it will always work for him :). The app plays any song choice clearly, has the lyrics, and has a clip from the original episode for reference. Runs very well, never had any issues. Please add more songs, like “Countdown to Calm Down”! This app is absolutely wonderful. There’s a song that fits for anything! My 3.5yr old’s behavior is improving and he sings some of them during times that they apply. I recommend this app to all parents! My daughter absolutely loves this app!!!! But with the most recent update, all the videos crash the app. Is their something in the works to fix it? Other than that, this would DEFINITELY be 5 stars!!!! We love this app, however since we switched to iPhone X with iOS 12, the app crashes while attempting to play videos. Pretty please fix this soon! The videos do not work on IOS 12! Love the app for the little guy but have had issues with watching the videos since updating to iOS 12. Anyone else? 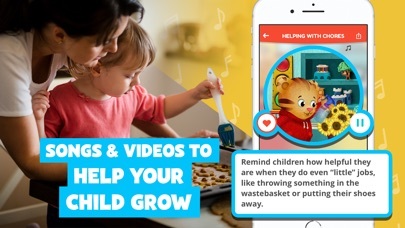 My wife loves this app for our little one and I downloaded it this morning after I updated my phone to iOS 12 but the app won’t play the videos for me in my iPhone and it crashed the app. It works on my wife’s iPhone which has not been updated to iOS 12 yet. I was excited to find this app and I was even more excited to find out that it’s available in Spanish too! Our daughter is bilingual and watches Daniel in Spanish, so to have the songs when we need them available in both languages is amazing! Thank you! The app has been very helpful in helping remind her of important life lessons. use this all the time, love it. it will need an update for ios12 though! Finally watched DT with my daughter since she loves it from babysitters. I fell in love but always mix up words to songs. This is a great tool. Please add more songs and videos! I love Daniel Tiger since I grew up watching Mr. Rogers! I would love to see more songs added since they are a BIG Help to me. Songs and visual Cues help me learn Best! I share the app with anyone I find that has Kids or that loves Daniel Tiger! This is My Favorite Daniel Tiger App!! we love to watch this show with our daughter. we even find ourselves singing the songs in certain situations. now we can listen to the songs with our daughter any time! I love Daniel tiger. I love the lessons they teach and the songs that go with it but there are so many to keep up with. Love this app because it always comes in hand. Daniel Tiger's Neighborhood is a great program. This is the only app for my son on my phone and he loves it. The songs help us in so many situations. Thank you! I love this app! Lots of great songs and videos! We love this app! Thank you Mr Rogers for changing television. Was the perfect tool to have at the ready when trying to help my son calm down. He was wound up and struggling to regain composure when I pulled out the newly downloaded app and found the perfect song. He was so caught off guard by a new way of helping that he immediately started following along with the song. Was perfect! I'm so grateful for PBS. Starting with the original and amazing Mister Rodgers Neighborhood and continuing to these awesome apps, PBS has always been supporting our children. 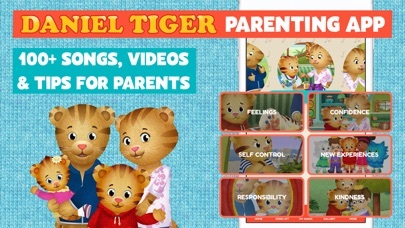 The social and emotional lessons that Daniel Tiger and this app teach are priceless. Thanks again for this app! There's a good amount of songs, but there's a good amount missing, too! We need more, please! I would even pay for the rest of them. I'm so happy to have found this app. Daniel Tiger plays a huge roll in our house when discussing behavior and feelings. Could you please add the songs about being quiet and also having alone time? That would really round out the song list and it's behavior that all parents deal with! I had been keeping a note on my phone of Daniel Tiger links to songs in YouTube. I never imagined all that and more could be on an app. These little songs are so helpful in dramatic situations with my 3 year old and they almost always help her snap out of an upcoming meltdown. 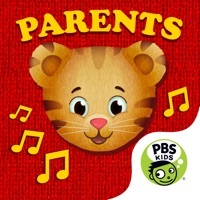 Thanks you PBS for providing tools for parents to better connect with their kids in healthy and supportive ways!! Absolutely LOVE this app! It is well organized and easy to use! My kids LOVE it too! And the best part of all... it's free!!! Not many cartoons speak to life's daily challenges like Daniel Tiger does. This app makes it easy to play the tiny snippet my Terrible 3's toddler needs to reset and recenter. So far, it's helping! UPDATE-- thank you for the fix! 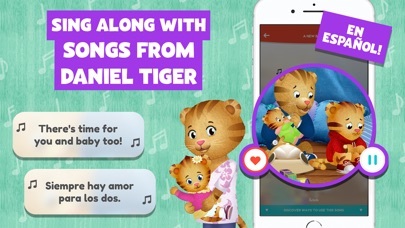 We love all the Daniel Tiger apps. I'm sure this one will be just as great when it gets fixed. It never has loaded, just crashes during load screen. :( Help! This is awesome! Tons of songs on demand to help teach life's little lessons. These songs work miracles! So bummed. The app crashes immediately after opening. I'm hoping it is an easy fix because my son LOVES Daniel Tiger and once it works I will happily come back to give a rave review. Would really like to give this app a proper review...if only I could actually open it! Please fix bug. Haven't been able to open it. I can't open the app either! It crashes 1 second after I open it! App crashes immediately. Please fix. Videos won't play back on iPhone 6. Immediately crashes. It only shows the first picture of Daniel tiger just to crash within seconds..it doesn't matter if I try reinstalling it or restarting my device, it simply won't work. Crashes instantly. Would love to actually use it. Wish I had this when my sons were younger! What a great resource to use with young children who are learning about routines, feelings, bring responsible etc. This is great for both typical kids and kids with special needs! There are a wide variety of topics covered, with relevant mini song, and video clip for each! Good job! I'd love to rate this app, but it keeps crashing every time I open it. I had to delete it from my phone. I was looking forward to using it with my toddler. Please work on crash issues. This is awesome! Daniel is already an incredible show. I sing these songs myself when the situation calls for it. This app makes it even better. The fact that it's free is equally awesome! Thanks PBS! Videos don't work or are disabled when the app is used in other countries. Please make viewing available for us globetrotters. Thank you. App keeps crashing have tried to uninstall and reinstall it.